Cats vs. gerbils, but not in the “cats eviscerating gerbils” sense that you might be thinking. No, the cats are saving the eviscerating for the mice that are apparently living in our basement unbeknownst to us. Well, formerly unbeknownst. 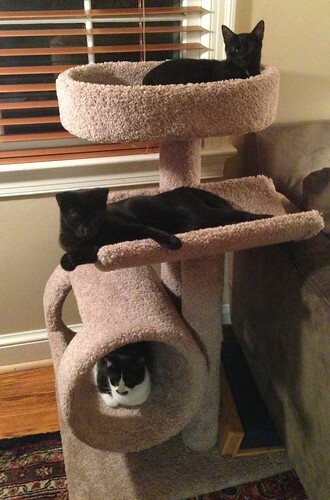 Their little corpses dangling out of our kittens’ mouths alerted us to their presence. No, what I am trying to do is contrast group sleeping patterns. A kitten for every shelf and a shelf for every kitten. It’s like Yertle the Turtle, but with gerbil stacking instead of turtle stacking. 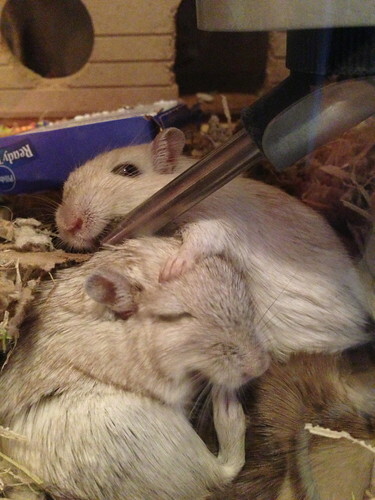 The cats cuddle with each other, but not quite in the same way the gerbils cuddle with each other…or rather, how they use each other as beds and to prop themselves up. I like how the guy on top there was all, “Now I’m going to use you to prop me up to the water bottle so I don’t have to expend any effort.” Meanwhile, middle guy was very earnestly cleaning his feet with his teeth. Come to think of it, the kittens clean their feet via mouth as well. I’m glad I don’t have to clean my feet with my mouth. And there you have the first in what will no doubt be a long line of cats vs. gerbil posts. We can only be so lucky.